From the iconic dome of the Boettcher Memorial Tropical Conservatory to the painterly water lilies of Monet Pool, Denver Botanic Gardens at York Street is a true Denver landmark. Its extraordinary rental sites include tropical plants, exotic blooms, rare and native species, and water displays across a 24-acre campus. Whether the occasion is a large and lavish event or a cozy, informal gathering, the variety of indoor facilities and outdoor sites has something for everyone. Wedding ceremonies and receptions are scheduled daily between 9 a.m. and 7 p.m. from early May through late September. 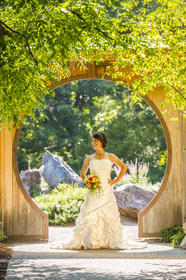 We offer six outdoor wedding ceremony and reception sites and four indoor sites. Our outdoors spaces can be rented from early May through late September and our indoor spaces can be rented year-round, including during the month of December. Host your holiday party in our glass Orangery with its spectacular view of our shimmering holiday lights. For more information on hosting your next private event, contact us at Private.Events@botanicgardens.org. Magical in summer months, this beautiful setting is our most popular outdoor wedding site. Lush, private area hosting a beautiful solarium surrounded by fragrant flowers, tall trees and shrubs. Exquisite setting overlooking Monet Pool, with an array of water lilies and other aquatic plants. This lovely garden is punctuated with asparagus fern, Delosperma and torch lilies as well as other South African beauties spilling from pots. West of the Orangery and overlooking the Monet Pool, the Gardens' largest wedding rental site, complete with misting sprayers and twinkle lights, can also be combined with the Orangery for a covered rental space. Features a two-story waterfall with an abundance of orchids, bromeliads and ferns and floor to ceiling windows that look out to the Gardens. Reminiscent of European Renaissance greenhouses, this space showcases seasonal color, exotic tropical and Italian cypresses year-round. This elegant hall is the largest indoor rental site and includes a stage, skylight and balcony. High ceilings, sky lights and a changing gallery of featured artists highlight this site. Adjacent to Gates Garden Court, this space is ideal for a meeting or small reception.